A document from a city in Hebei Province sets forth regulations on religious beliefs at colleges and universities. 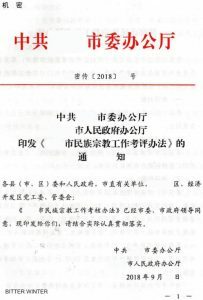 Bitter Winter recently accessed an internal document, issued by municipal authorities in one of the cities of Hebei Province in the north of China. Entitled, the Notice on the Printing of Measures on the Evaluation of the Ethnic and Religious Work, it details a list of activities for all levels of governments and Communist Party committees under the city’s jurisdiction to regulate the religious beliefs of students and teachers. The document prohibits teachers and students from abroad preaching or promoting religions while local religious students are not allowed to engage new believers among classmates and entice them to participate in religious activities. The dissemination of religious thought through newspapers, books, audio-visual products, and other means should be strictly forbidden. The local authorities are ordered to eliminate venues of religious missionaries, religion-related meeting places, and religious goods stores within the teaching facilities and take actions to prevent their establishment. Recent reports from across Shandong raise concerns that other municipalities across the province have been implementing similar measures with damaging consequences to students. Zhang Qianqian (pseudonym), a resident of Shandong’s Zibo city, was told that she wouldn’t be granted her diploma if she didn’t renounce her faith. Ms. Zhang, who was raised in a Christian household, was in the middle of an internship at the time and found the situation trying to navigate. In another case, Wei Tong (pseudonym), also a Christian, is currently studying at a medical university in the province. She was recently discovered to be a believer by her teacher and has since been questioned five times because of it. 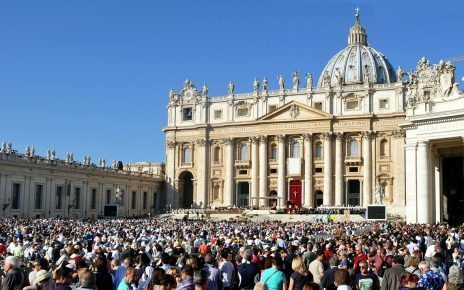 Of her experience, she said, “They advised me to give up my faith, and prohibited me from preaching the gospel and attending gatherings. I’m under a lot of pressure right now.” Ms. Wei is worried she might be summoned for an ideological conversation in coming days. 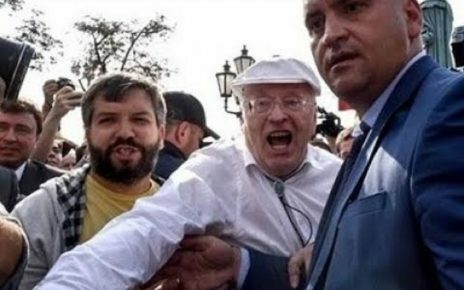 University fellowships are under attack as well. Authorities recently shut down a meeting place for student-believers at a nearby vocational school in Zibo city’s Zhoucun district. The venue belonged to the Sola Fide Christian theological doctrine held to distinguish Protestant churches from Catholic and Orthodox churches. The students were getting ready to conduct the first meeting of the semester on September 7, when police officers ambushed them. In the end, a local Christian was arrested, and the landlord of the venue was forced to terminate the lease agreement. The students are now without a place to congregate. 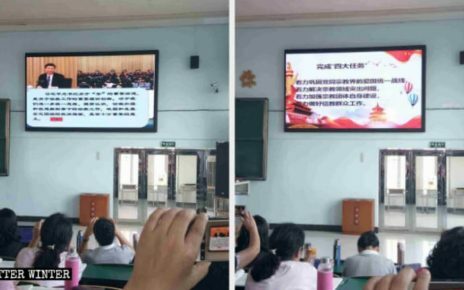 Similarly, at the Haidu College of the Qingdao Agricultural University in Shandong, students have been sought out for one-to-one conversations during which the teachers ask about their living conditions and religious beliefs. As a result, the college’s Christian fellowship has been suppressed as students have been warned of consequences if they continued to attend the meetings. 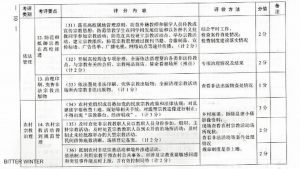 Analogous guidelines suppressing religious beliefs in universities have been issued in Heilongjiang as well.